. Its rich texture and hues (which range from browns, greys, and blacks to multicoloured earth/rust colours) give it a dramatic look. Slate flooring commonly comes in tiles or "riven," which is split slate which is less common. Riven slate has a somewhat rough surface that provides a bit of slip resistance. Its thickness tends to be uneven, which can make it trickier to install than tiles. Cut slate tiles have smooth surfaces and even edges. However, they can be slippery, so if you're going to install them in a bathroom, be careful not to polish them too much. Choosing a textured variety can also help keep down slipperiness in areas that have the potential to get wet. When needed, clean with a wet mop, using a diluted household detergent. If a stain requires scrubbing, use a nylon- or natural-bristle brush (never use a brush with metal bristles as they can permanently scar the floor). 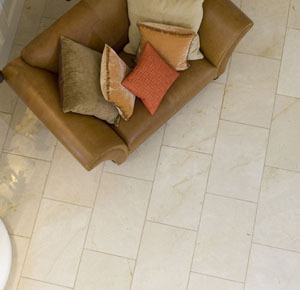 Slate floors are popular in bathrooms, kitchens, cellars, and slightly outdoor areas (i.e. verandas) because the natural stone is waterproof, making it a good choice where moisture may be present. Slate is very durable, doesn't require much maintenance, and due to its dark colouring, hides dirt well. Slate is a tough stone that can take a lot of traffic. It's easy to care for. Slate doesn't just come in greys and blacks but in a range of beautiful, subtle hues that can enhance many decors. It works nicely in kitchens, bathrooms, hallways, and on porches.